Note: I had trouble with the blog-manager service provider. We hope the website is now working correctly! 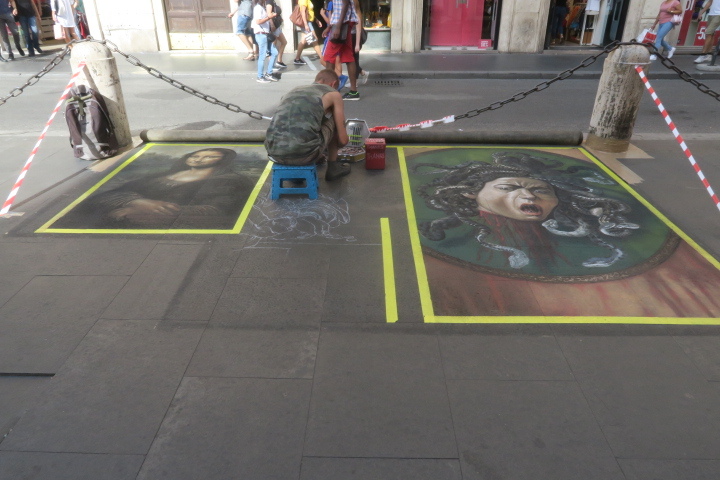 In Florence we had to change trains …. from a high speed, reserved coach to a bunny hopping, scramble-on, multi-stop, 3rd class coach …… and we only had 3 minutes to run from platform 12 to platform 3 …… we made it! Actually the air conditioning on this train was better than the train we just got off. 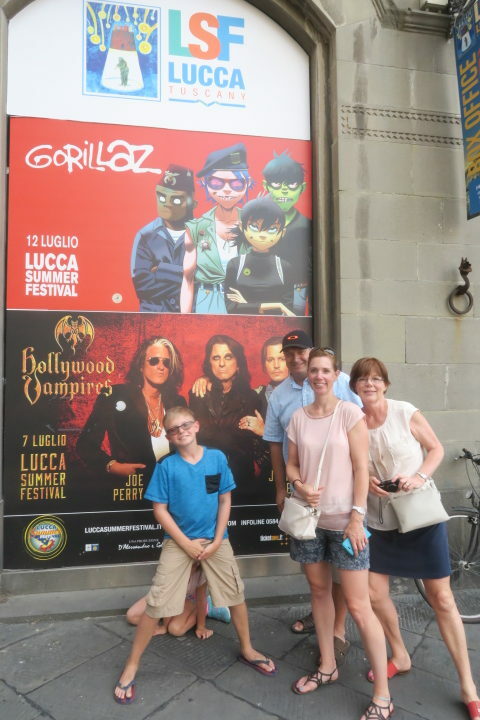 When we got to Lucca it was 33°C (felt like 39° with humidity), so it was taxi time again …… no dragging luggage on these streets in this heat ….. 20 minute wait for a 5 minute drive. 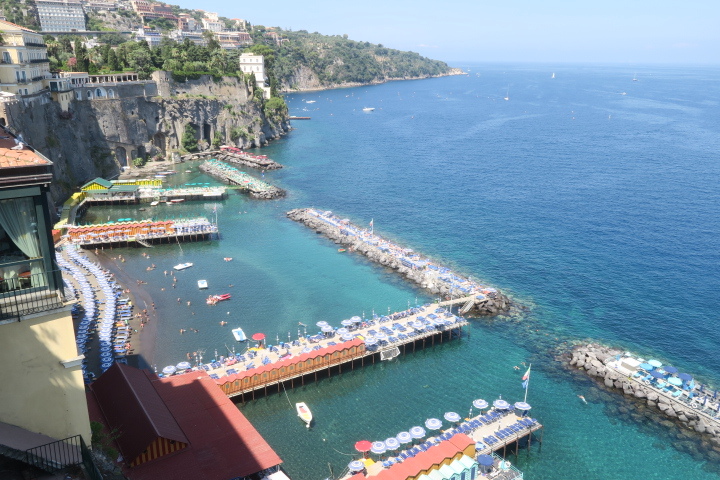 We have to see Franco at the Puccini Hotel to get the keys for the VRBO suite. He assists us up the 70 stairs into the two floors of suite …… boy is it hot in the suite. Franco comes up again and helps turn off the heat so the air conditioning works properly….. yes the heat was on! 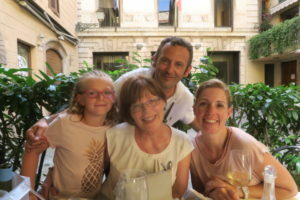 We wandered and ended up at a little restaurant called Osteria da Rosolo. 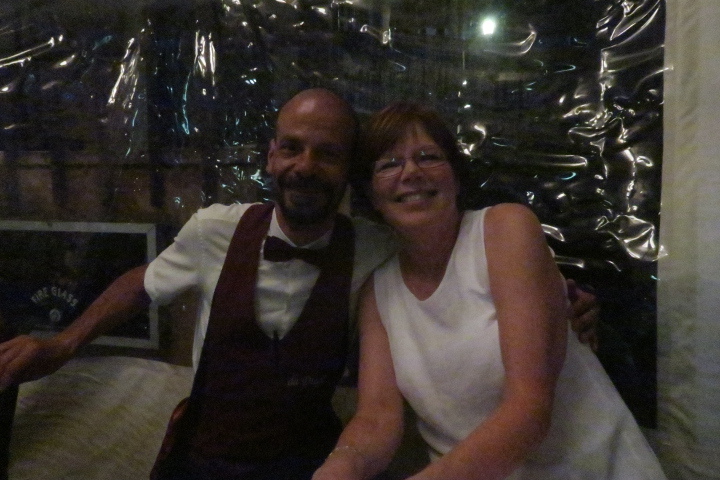 Great meal, absolutely fabulous service ….. Salvatore kept us in stitches throughout the meal, joking and making many great recommendations. He was a great foil for Brian, Taylan and Christa – quick and as sharp as a tack! 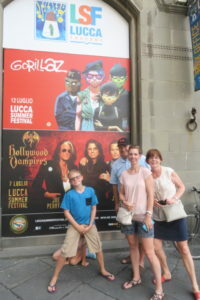 We highly recommend them for a meal …..
After dinner, we walked pass the main square and took pictures of the concert posters …….. major music festival going on with groups like Ringo Starr (and his “All Star” band), the Hollywood Vampires (Johnny Depp, Alice Cooper & Joe Perry), Lenny Kravitz, the Gorillaz, Roger Waters (from Pink Floyd), etc ….. quite amazing …… didn’t know it was on! 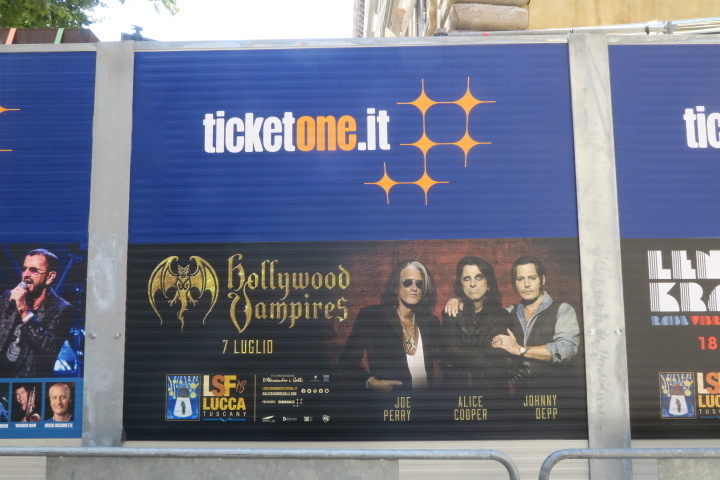 Unfortunately, the acts available while we are here were sold out ….. not fair. 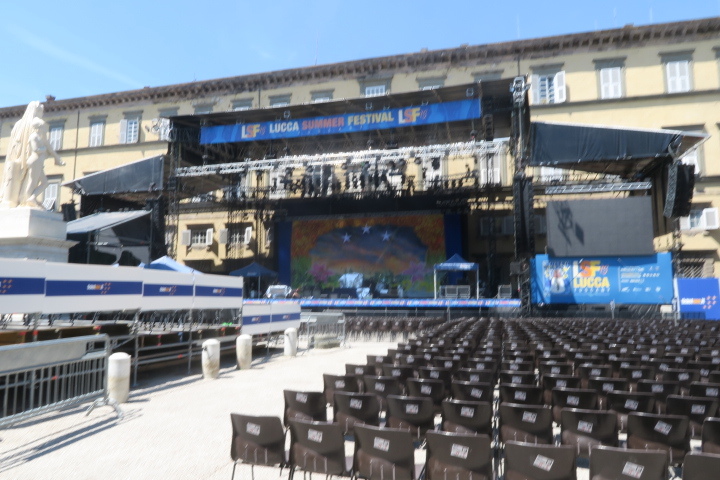 Even though it’s in the middle of the old city of Lucca, you can’t hear any of the concerts unless you are within 100 meters. To cap off the evening, we watched the Russian / Croatia world cup soccer game outside, at a restaurant in the same square we are occupying. The game was interesting but not as interesting watching the rabid fans ….. the expressions were priceless! The Croatians won …. good for them. To finish the travel day, I blog what we have done ….. apparently not tonight – the website website is not accessible to add the write up for the day. I’ll check it out tomorrow…… maybe. 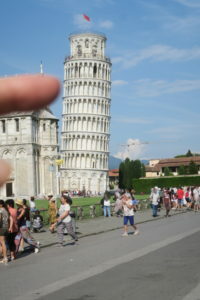 Pisa day! 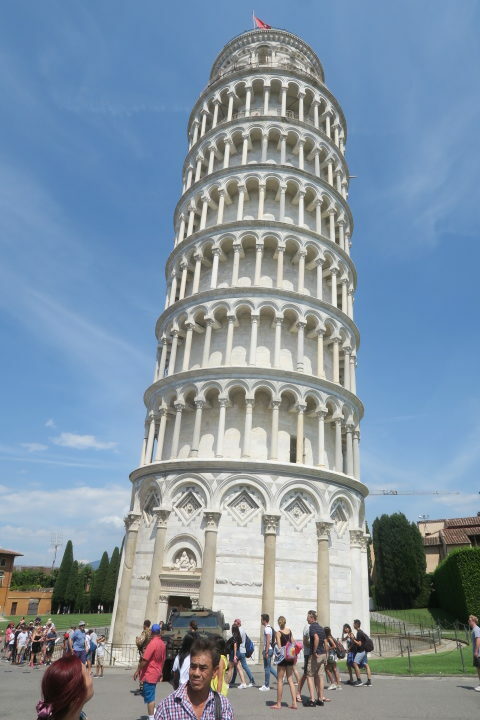 …… not the food – the tower …… go there by local train – you have to admire the Italians resilience and ingenuity to travel this way day in and day out. 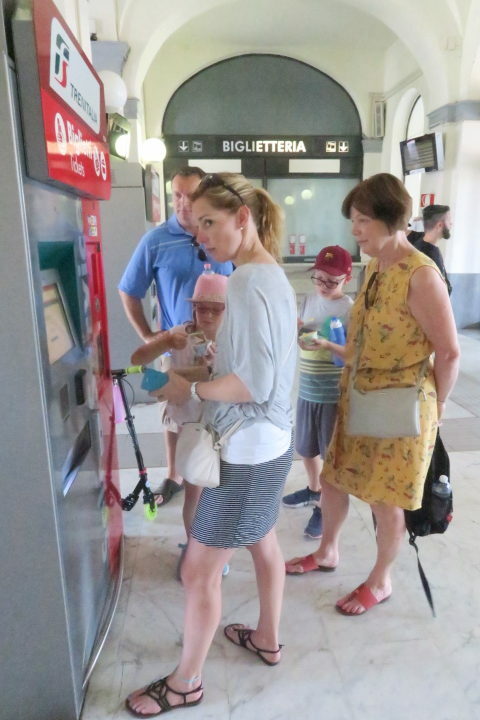 It took us (Christa) a good twenty minutes to figure out the ticket machines – but we got there on time …… again it was extremely hot. 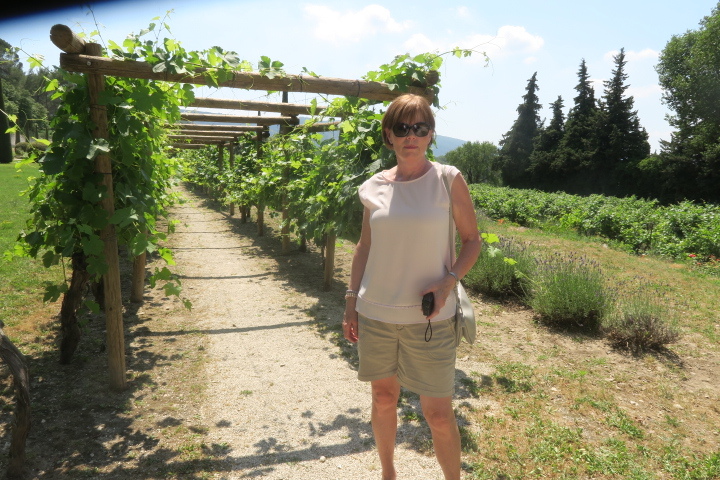 We tried to stay in the shade as much as possible …… hard to do with so many open spaces. The ingenuity comes with them knowing when and where they can jump the train without a ticket ……. so far, on all the local trains we have taken, no one has checked whether we had a valid ticket. It seems the only ones they check are the high-speed, inter-city trains, although the train to Cinque Terre appeared to have armed police when we took it a day later. 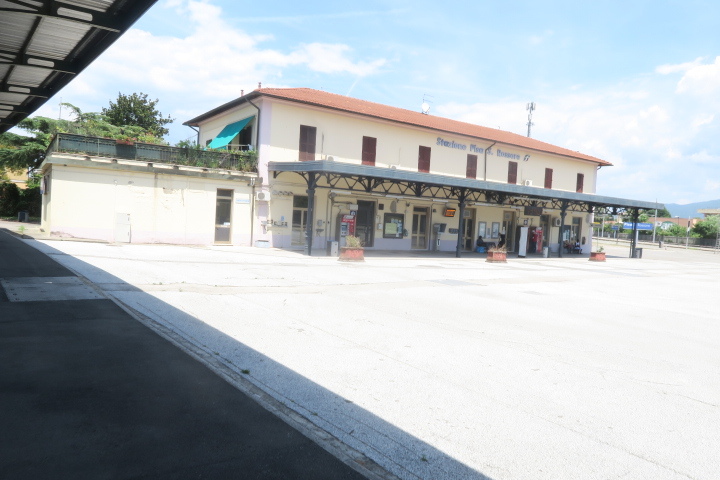 When we got to Pisa, we escaped at the San Rossore station …… pretty desolate – yet there were a lot of people getting on and off …… very hot again. The GPS said 770 meters, but it felt more like ¾ of a kilometer. In front of the gate to the piazza, there were multiple vendors hawking all sorts of trinkets …. the usual trash, that tourists love. 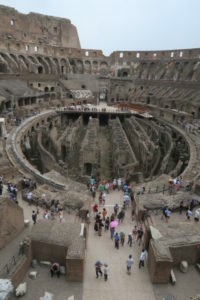 Once you (oops, just got interrupted by the ticket checker, wanting to validate our seats … pardon me for a minute) get through the gate – it’s dodge and weave through the numerous people taking their novelty photos (individual & group). The tickets to book a time to climb to the top of the Leaning Tower can be purchased in the long brown building, at the second entrance on the right. Pretty straightforward …. pick a time, indicate the number in your party, pay and then wander until 10 minutes before your scheduled reservation. 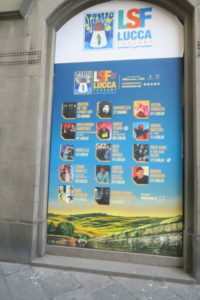 At 10 minutes Line-up outside the tower entrance. 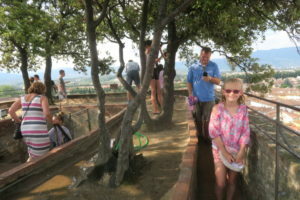 Wait until called, go in climb the 251 steps to the top. Admire the view – take some pictures – return to earth. The price was very reasonable, 18€ to go up and 0€ to come down (I guess in case someone decides to come down the fast way without paying.) 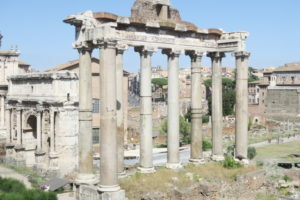 All money goes to the preservation of the monuments. Our time was for 3:45 …… and we got the tickets at 2:20 so we calculated it was beer-o’clock ….. with munchies. The ladies did a spat of “catch and release”. The kids were more successful at “catch and land”. They got both large and small stuff for their buddies. The view from the top is impressive and you don’t really notice the tilt (I’m inclined to believe). 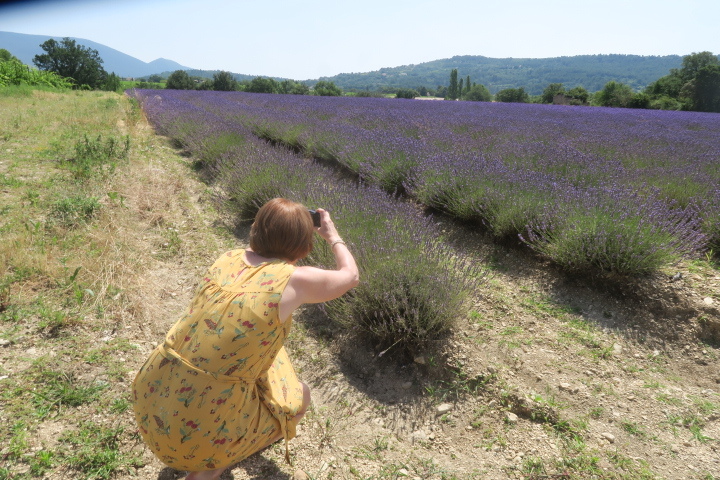 We got pictures of the town below from all angles and of course the six bells ….. the other tourists are very obliging to take your picture if asked, they’ll even use your camera if you loan it to them. 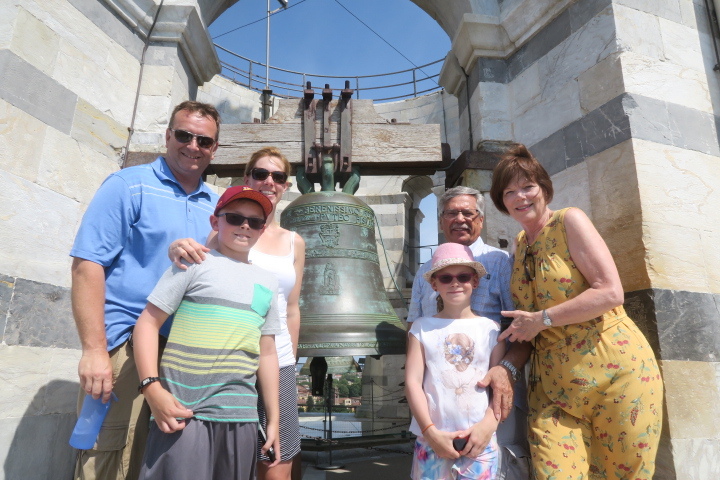 Note that they no longer ring the bells as the vibrations were causing structural damage. 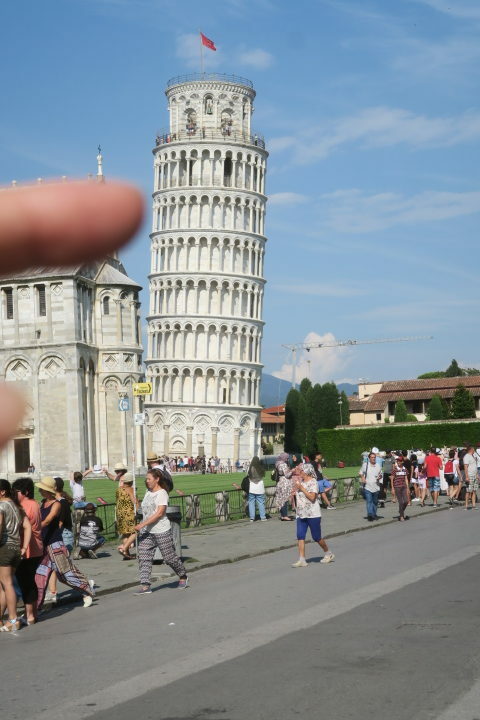 Don’t want it to topple it with people inside. 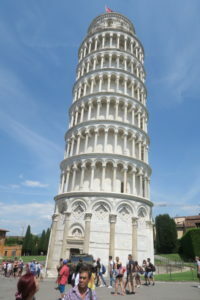 Legend has it that the gods were mad at the clergy and Zeus decided to teach them a lesson by pushing on the tower ……. 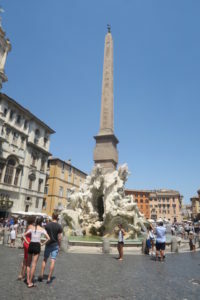 to topple it, but then relented and let it stand. 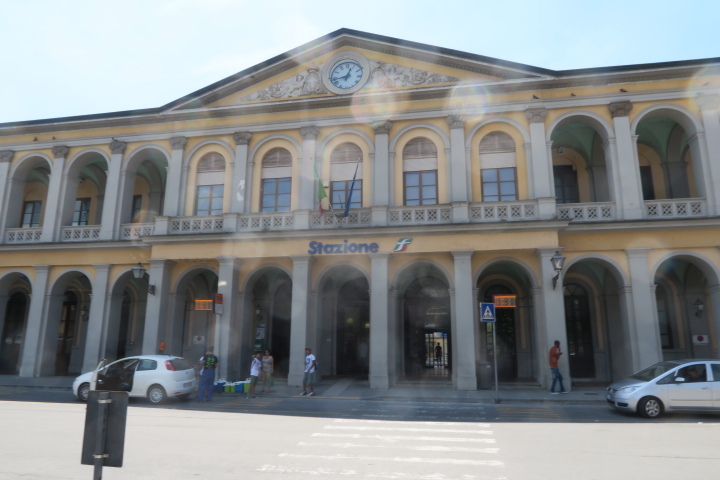 From there it was back to the San Rossore station and try to figure our way back to Lucca ….. Christa managed it again with minutes to spare. The train was packed so we stood for a portion of the way. Once back at home base, showers, freshen up and rest before dinner. We decided on a new place in what the locals call the coliseum (not) a circular opening surrounded by buildings with four arch ways for access. There must have been 15 open restaurants in the space ….. and to the delight of the kids, hundreds of geckos on the building walls. Heading back by a circuitous route we come across a point where we can see and hear parts of the Ringo Star show just as they start playing “Yellow Submarine” …… again the kids are surprised and happy. 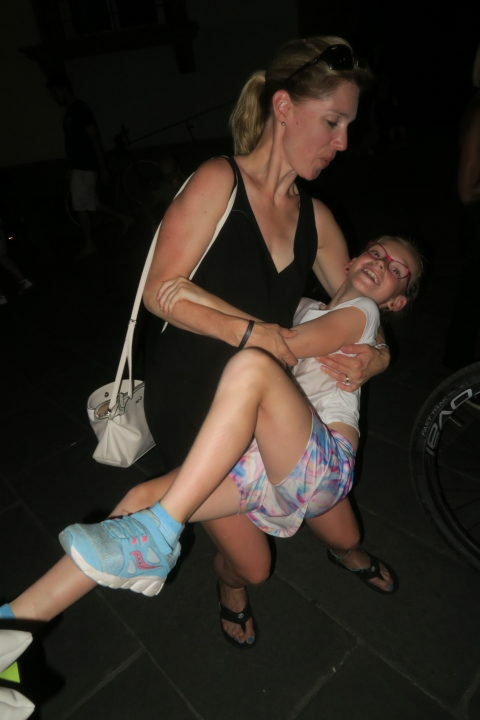 Christa and Harlow put on their own little dance show …. bravo. Afterwards, while the kids watched a movie – Brian, Shayne and Christa had a few Canadian Club night caps …… and chatted it up with two couples from England – Loraine, Michelle, Nick and “Brat”. Interesting stores (probably some woppers) were exchanged ….. a great time had bye all. Third day started with a quick meal around the corner and then more train travel …. 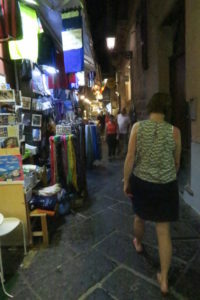 this time to Monterosso in the Cinque Terre. Three stop, two train changes and just over 2 hours time. Great sand on the northern beach. The kids loved it overall better than Venice’s Lido beach. After a quick late lunch and some souvenir shopping, we jumped the boat to Vernazza …. just a short 20 minutes. 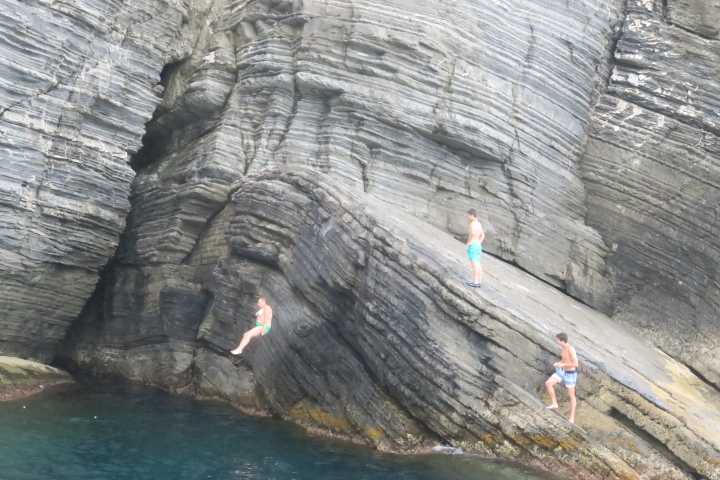 When we arrive we get to see some amateurs cliff diving (it’s not a cliff and it’s more like jumping) …. bravo to them! The whole boat applauded, disembarked …..
…. and we are doing more souvenir hunting. 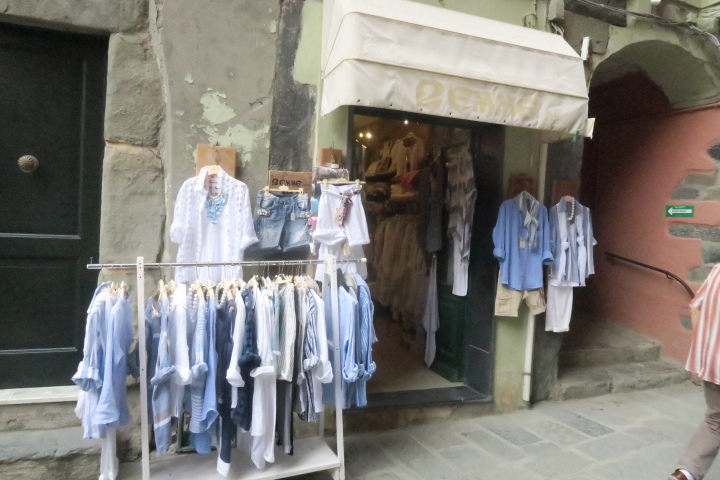 You have to realize this is not window shopping, most shops don’t have windows, just doors …. and door shopping just doesn’t sound right. When we’re shopped out it’s head to the train station to check out the schedule & price. Christa’s default job now ….. which she performs very well ….. bravo Christa. She manages to get tickets for the next train scheduled in an hour and then convinces us to hop the train ….. we do have the tickets, even though it’s for an hour later …… besides it’s too crowded for the ticket agents to get through the train. That was a full day ….. and they have the streets blocked for the festival, so we go back to the Coliseum area restaurants. After the kids retire, the guys go for a beer … what else and to watch the semifinal World cup game (England & Croatia). Again interesting to watch the fans …… Croatia wins. Last full day is relax and recoup day. 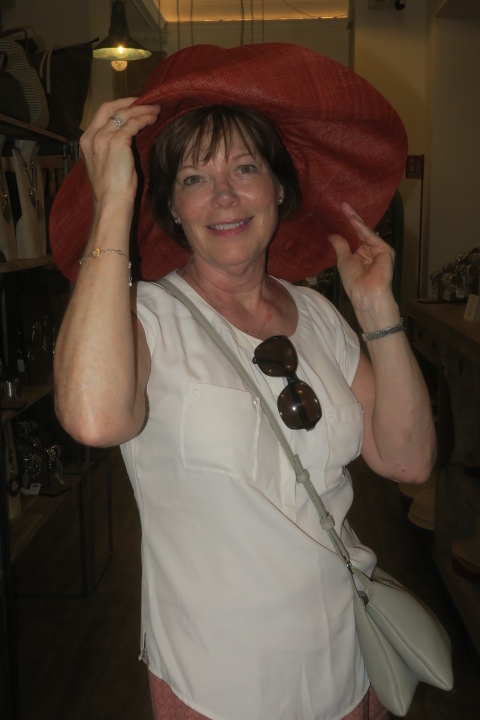 The ladies want to shop …. Brian needs to fix the blog and Taylan & Harlow want books. So it’s divide and conquer …..
Brian works with the service provider to fix the blog – they did a program update that invalidated admin privileges for some users …. Brian’s site was one impacted …. after 70 minutes they decided the easiest fix was to restore a backup to Sunday ….. when that didn’t work they restored to Friday. Some of the blog and some picture were lost but could be re-added. Success! Now to catch up with the others and have some fun. Late afternoon, while the ladies are still shopping Brian and Shayne take the kids to the old medieval tower (Torre Guinigi) with trees growing on top. 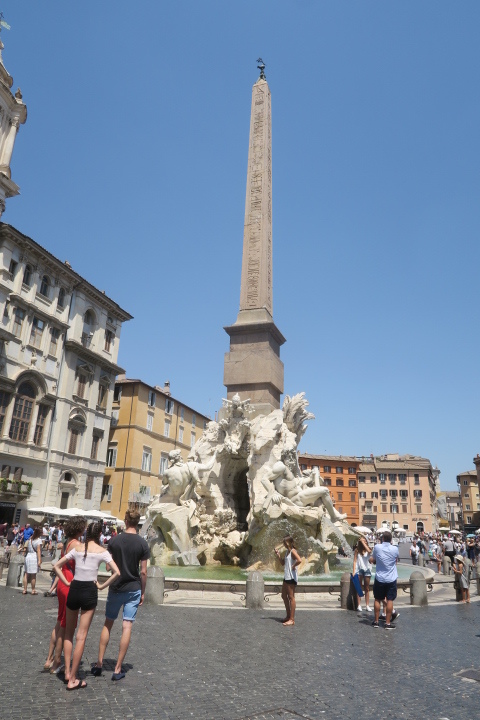 It’s only 430 meters away and 241 steps to the top. Another hour spent, but well worth the effort. 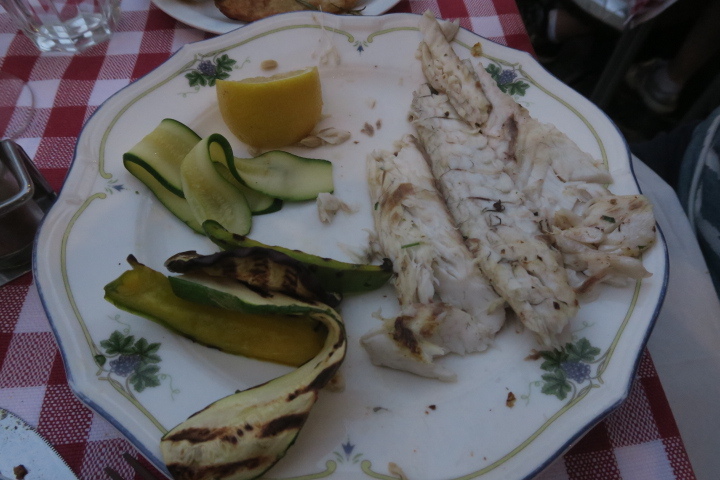 After finishing catch and release we go to dinner …. 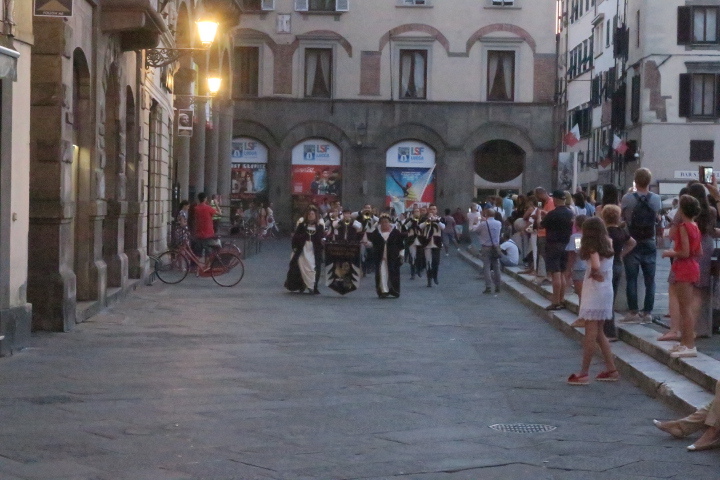 and a band goes by dressed in traditional medieval costumes. 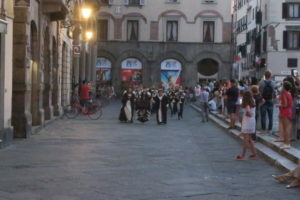 It was as if they were preforming to give us a farewell sendoff. A nice way to end the night. Packed and ready by 9:00 so we can catch the 10:30 train to Florence to transfer to the Rome/Naples train at 12:38. At 9:45 panic starts as the taxis have not arrived …… the police have blocked all major roads for the Roger Waters concert. Finally one taxi arrives at 9:50. Just enough for the luggage and three people ….. the ladies insist they can walk while the guys and Harlow take the taxi. Their logic is the guys can manage the luggage better at the station, while Harlow is not well and they can carry her if necessary. 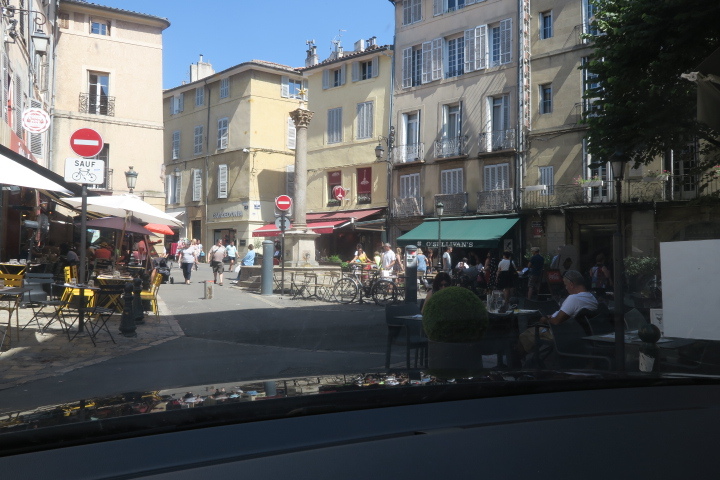 So they start walking and the taxi heads for the town exit ….. unfortunately with the major roads blocked, we end up going all the way around the old town walls – a taxi ride that should have be 8 minutes turns in to 30 minutes. The ladies arrive 2 minutes later, they were also blocked at every turn, having to take multiple detours. Check the train schedule for platforms and hustle all the luggage and family through the underground to platform 4 …. with 5 minutes to spare. This leg of the train is unassigned seating, so we get as many together as possible ….. poor Harlow still not well and the heat & rocking train don’t make it any better. We make it to Florence on time, but have to wait for the connection as it is 10 minutes late. Harlow is still ill so we rest as much as possible in the heat. 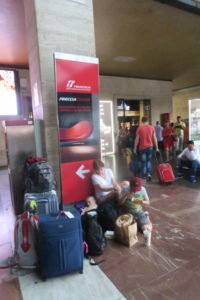 Finally the platform is posted and we can load our luggage on coach 10. 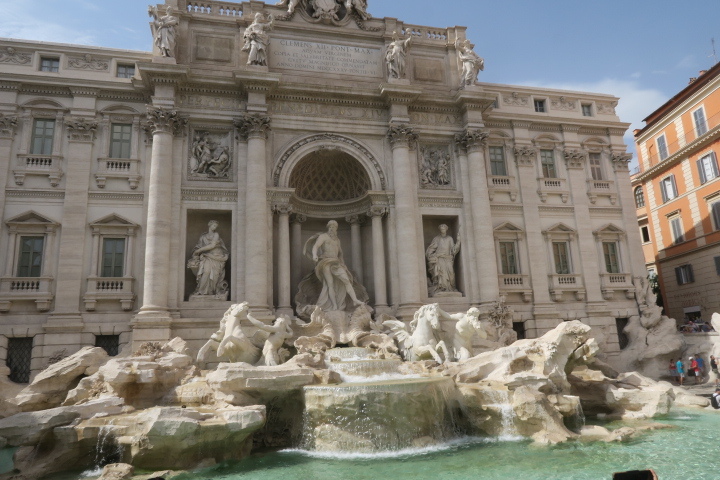 In one and a half hours we land in Rome where the Grads get off for two days before they head home on Friday. 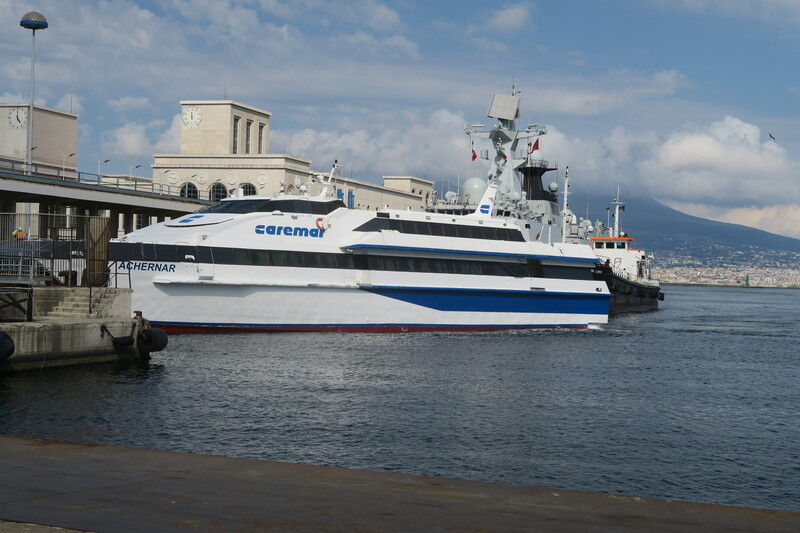 Brian and Gerda continue on to Naples to catch the Hydrofoil for Sorrento. We landed at Venice Marco Polo airport Thursday, July 5th, 8 minutes early even though we left 5 minutes late – that must have been one strong tail-wind. The 6am flight was almost full with about 130 aboard …….. we gated at the north end of the airport and were bused to the far south end before boarding. The flight was typical for a no frills airline – one beverage (about 4 sips) pay for everything else. Up – down no drama ….. no babies wailing ….. hardly any time to have a nap. That’s what I call a good flight. 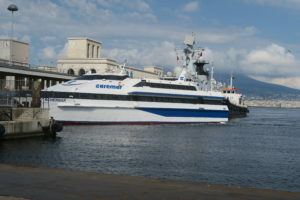 Once we disembark, it’s get luggage and decide which form of transportation to take – bus, taxi or boat. 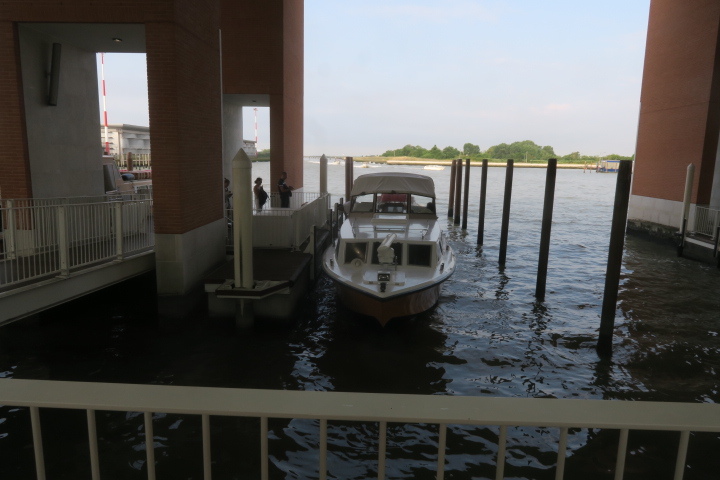 We decided to try the water ferry …. ’cause it’s different. Turns out it’s not the fastest form of travel – 1hour 30 minutes ……. 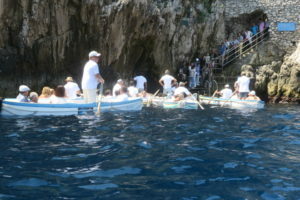 still, it was a leisurely way to get to the islands and see a lot of sites we wouldn’t normally see. 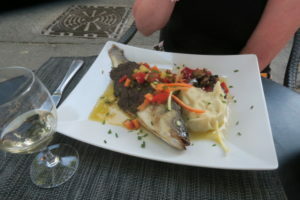 We get to our hotel around 11, drop off our bags and go for a stroll (really more of a dodge people) to the fish market and other sites, returning at 1pm for a bite and a pint. Room is ready at 2:40 ……. shower, nap and a change of clothes before we try to find the Grads. During this time there was an intense thunder storm. By the time (6pm), we are ready to go out, you can’t tell there had been a storm. Now for the Grads, we have the address, general area and Gerda’s cell phone. It takes about 45 minutes to walk to the piazza near their place, the cell phone blue dot people help us incrementally get the rest of the way. How did our ancestors ever do it? 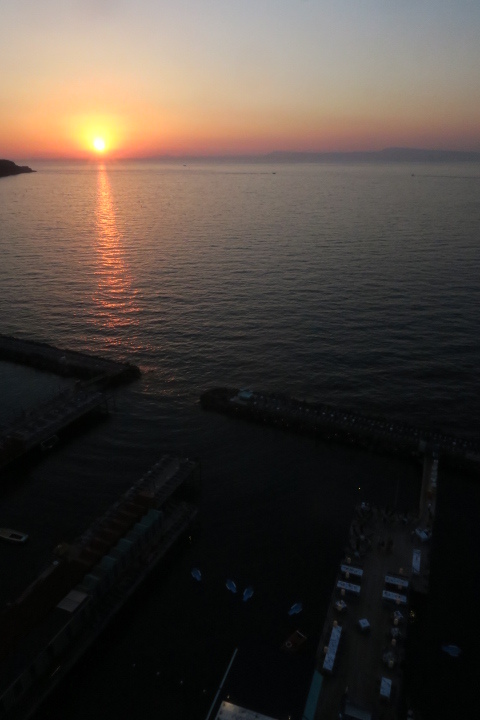 The Grads had a fabulous time in Barcelona, spending a lot of time on the beaches …. Harlow even got her hair braided in cornrows – looks beautiful. 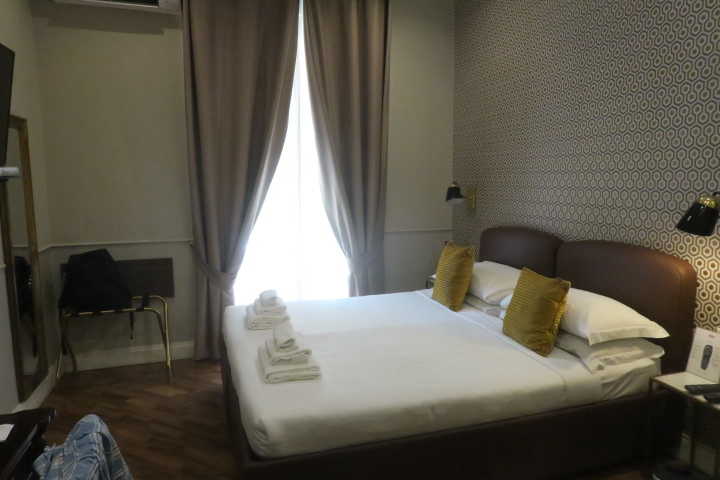 They do have a very nice Venice VBRO suite – we’re almost jealous. 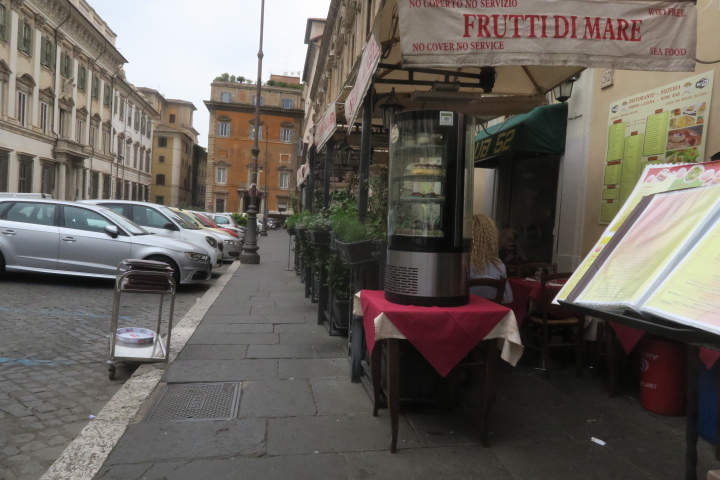 Rather than go back to the “Rialto” bridge, we try the restaurant down and around the corner. 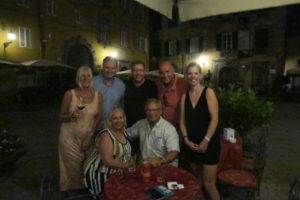 After a good meal we grab a gelato nearby and decide to head home as another storm is brewing – lots of lightning. 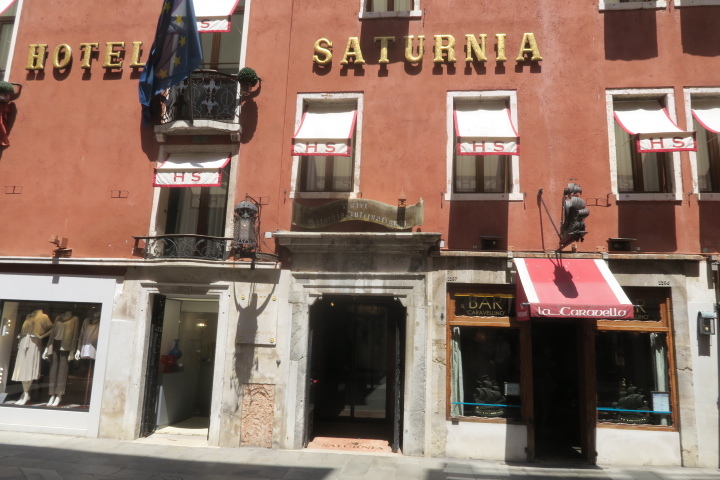 You can usually tell it’s time to head in doors when the winds pick-up, the temperature drops, the gondoliers start covering their boats and the waiters start moving their tables & chairs inside. The last two being the most important. So time to boogie when all four happen. Regardless, on the way back we do stop to listen to a young opera singer. She was very good ….. notice the added drama of the lightning in the background above the church. About 10 minutes after we retire, it pours …… with winds getting heavier and more wild lightning …… I’m sure a lot of people got soaked. Today is “beach” day …… yes the grandkids want to visit Lido beach …… 5 kilometers of fine sand. 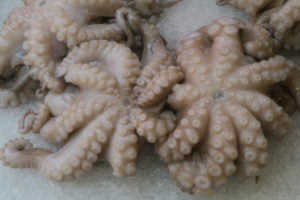 So we go for a tour of the fish market with the Grads, then it’s to the San Marco mall to get gelato. 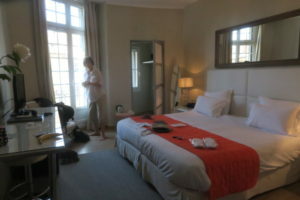 Afterwards we show them our hotel room while Brian & Shayne have a beer. Next stop, the vaporato (water bus) to go to Lido …… 10 minute wait, 20 minute ride and a 15 minute walk, we’re there. Fine sand everywhere. 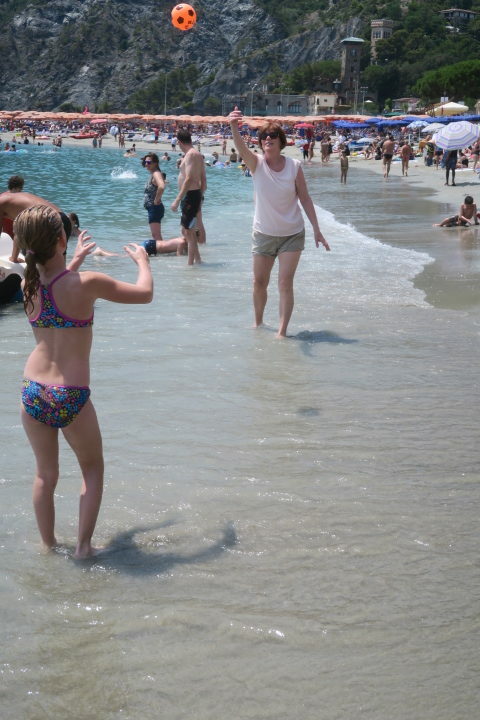 The kids can walk out for quite a distance before the water gets too high ….. they love it. Playing, swimming and digging while we have a beer on the beach – just perfect! Time to head back after 3 hours (6:00pm), the kids are hungry. 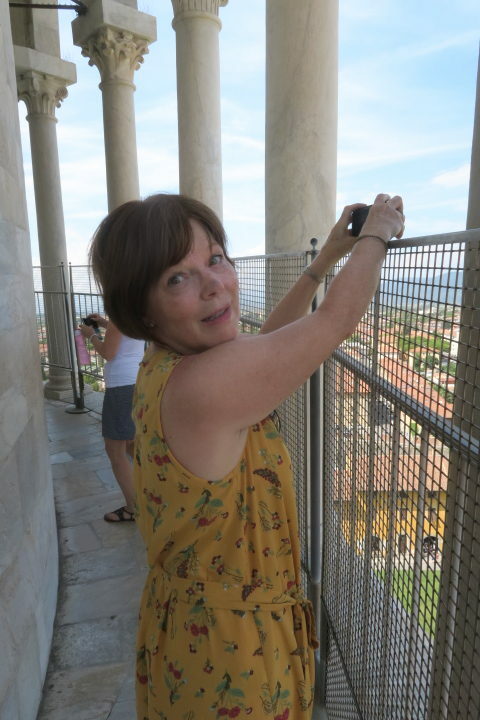 We land at San Marco pier and Gerda catches us a gondola ride right away. The kids are thrilled. 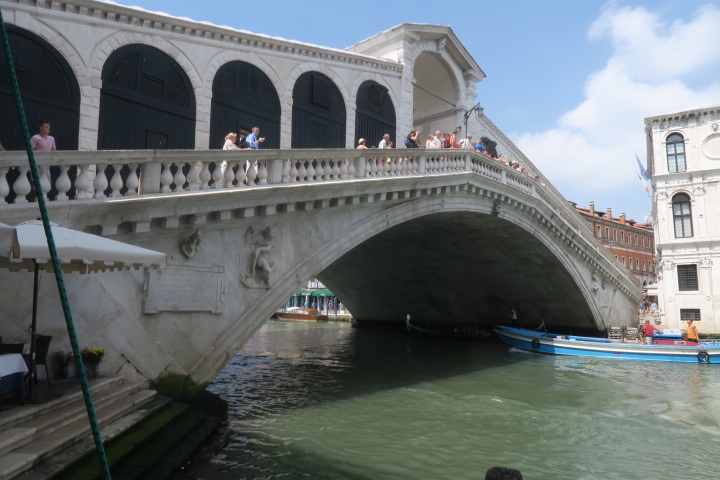 We go into the Grand Canal and then back into a smaller, side canal. Once we hit the side canal, surprisingly it is very quite. 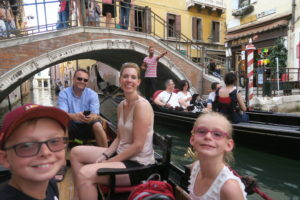 Disembark, gingerly, so as to not tip the gondola ….. breath a sigh of relief, and move on to dinner by the Rialto bridge. The kids like it cause they can get burgers and fries, the adults like it cause the kids are happy. That was a very fast two days ….. but the kids did love it – Taylan got a wireless model Ferrari and Harlow got a sleeping puppy doll (it’s so life like). 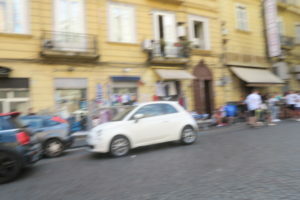 Up earlier today – we have to take the vaporato to the train station and it’s usually packed – so the earlier the better. By the time we go along the 15 stops, there is barely room to breath. Pack to the gills the boat expels the passengers with relief on the part of all. Entering the train station is not like an airport. Yes, there is security but there are no segregated areas …. 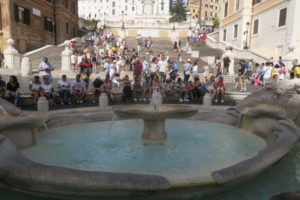 just a big mass of churning people – swirling in many directions. Great for people watching, not so good to carve your way from point A to point B. 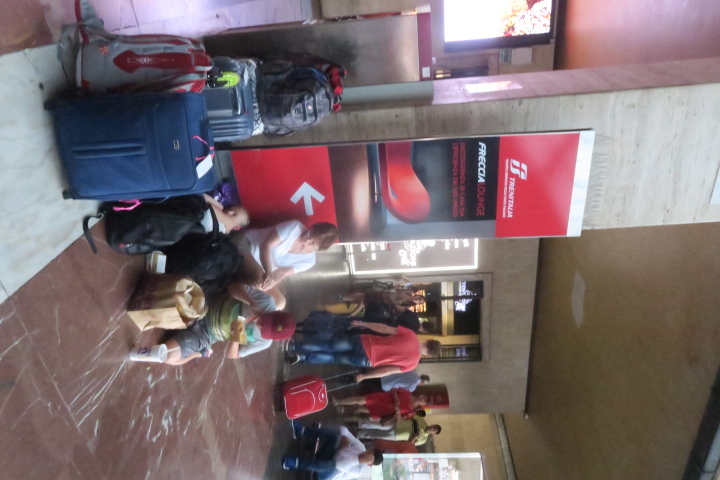 We do make it to our train on time and get seated ….. always fun trying to get the luggage stored where you can see. 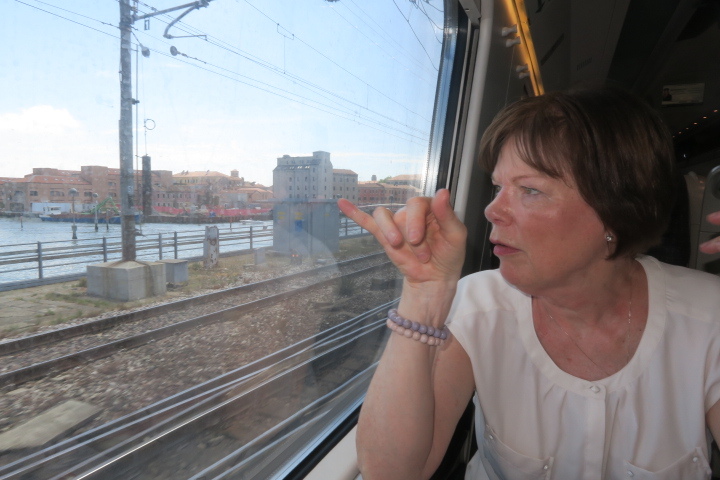 …… And we’re off again – time to say bye to Venice …..
From the Marseille airport we skin over to the Hertz car rental. It’s 32°C and there are 18 people in line before me, all wanting vehicles. 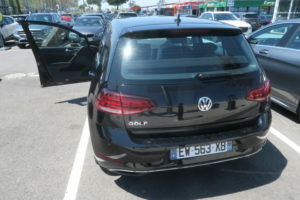 It took over an hour before we got our car, a brand new Golf VW, with only 1400 km. After some help getting the nice french lady in the dashboard to speak english, we’re off to “Hotel de France” in Aix-en-Province. The trip goes well until we are a few blocks from the hotel …… construction and roadblocks everywhere. 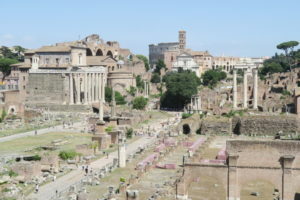 Not the roadblocks you are use to back home, but actual, locally imposed and controlled hydraulic metal pillars* at least 30cm (~12 inches) thick – you need a special card to gain entry. 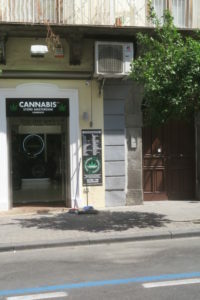 Guess what, we don’t have one, so we had to backup, turn around or go the wrong way down one way streets. Did I mention most of the streets are one way ….. usually in the wrong direction! After going in circles for what seemed like hours, we finally saw a sign to the hotel ….. and ended at an intersection with a pillar in the left and forward roads. The road back was too restricted to back up and the right one was free … but there directly in front of us, on the other side of the pillar was our goal! 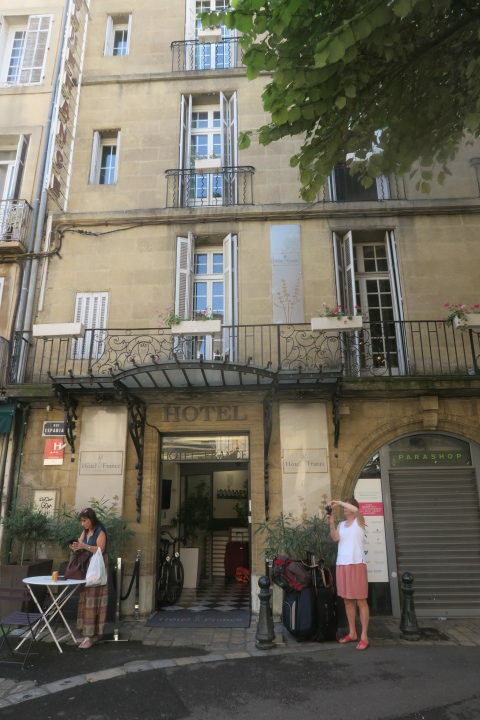 Hotel de France – executive decision – let Gerda go in to get instructions (and drop off the luggage), while I maneuver the car into a position so other vehicles can skin around us – extremely tight. Gerda came back with a map and instructions to parking, which I proceeded to get wrong by turning left instead of going straight – backup ….. turn, crank the wheel ….. repeat and finally get back on track. Piece of cake after that ….. park in the 4th level underground stall 1119 easy (remember that). The hotel is considered a three star, but was quite comfortable – one of the better rooms (best washroom) to date. 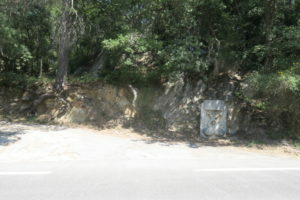 * We saw a tourist try to follow a local vehicle into a restricted area. The metal pillar came up through her radiator ….. Everyone watched in horror ….. not something you want to happen or expect to see! 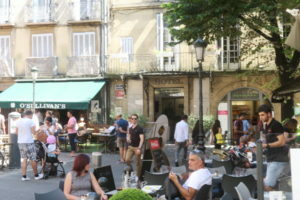 After a rest, we did a tour of the area and were pleasantly surprised at the diversity of cafes, shops, people and architecture. 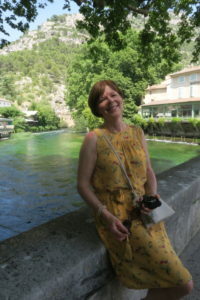 Despite the problems getting here, great choice for location to Gerda. We had a good dinner and then continued the walk-about, and realized that there were multiple gathering hot spots …. we counted at least 5 within an 8 square block area. Each one different ….. very interesting – but time to head back for sleep. 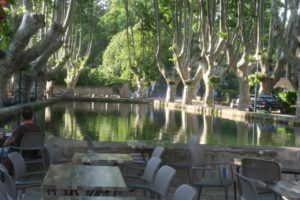 After a leisurely breakfast, we checked out of the hotel to head to Lourmarin our next stop. We are to meet the VRBO owner Mireille at 3:00 …. leaving at 11am should be plenty of time ….. so we thought. I head over to the car park, while Gerda watched the luggage. By taking a short cut, that the hotel clerk had pointed out, I quickly found the parkade and went back to help Gerda wheel the luggage over. Four levels down and go to the stall number 1119 ….. except we can’t find 1119. Back and forth, from one end to the other ….. not there – and it is as hot in the underground parkade as outside! After 45 minutes, Gerda catches a young passerby who tries to help and finally takes us to the control center. They check their records and tell us no vehicle entered the parkade when we said we had. The manager rechecks and tells us we are in the wrong parkade …. there is another larger one to the north! Wow! 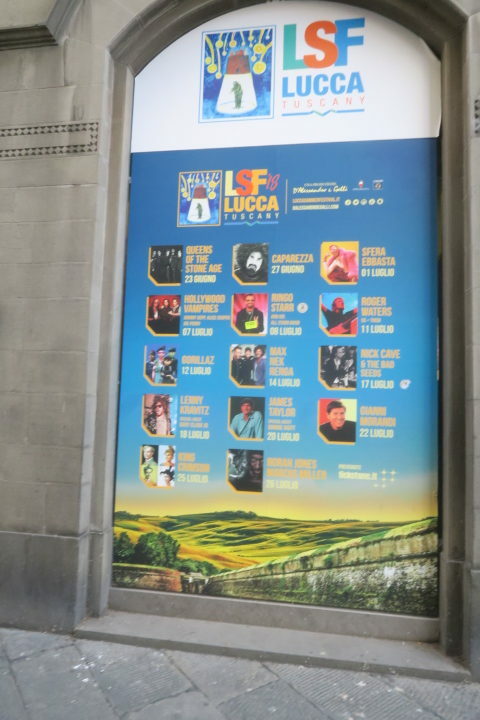 Totally unexpected …. so we exit and go there blocks north, enter the other parkade and find our car within 5 minutes! Who would have thought that parkades could cause so much angst. Back on the road and finally moving forward to the next adventure. We arrive at Lourmarin about 2:30 so lots of time. Actually we’re now on “beer time” until Mireille shows up. Wait, drink and people watch – cause we don’t know what she looks like. Around 3:20, as I enter the condo block, she comes out. 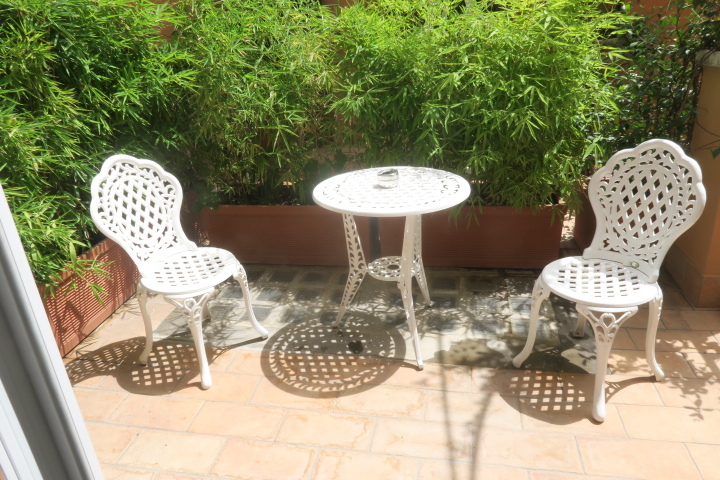 We get instructions on the whole suite and surrounding area ….. very happy with the accommodations. This will be the first time we can clean some of our clothes ….. they seem to always be damp from sweat. Once she leaves, nap time again before doing a village tour. 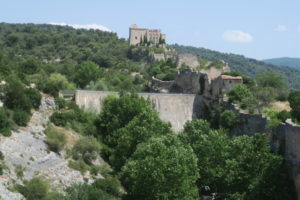 Just on the edge of the village is a castle – everything larger than two stories and with no attached buildings is called a castle, where we would call it a chateau or larger house. 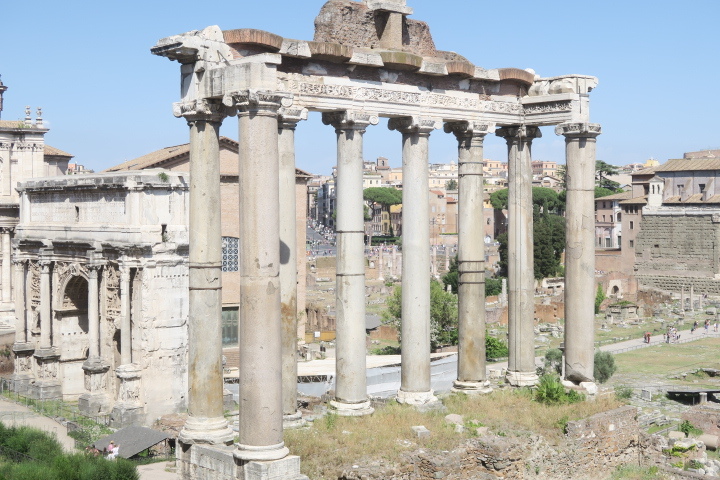 Interesting structure, with a well groomed landscape ….. but not opened to the public at this time of day. Dinner at 7:45, is late for us but early for local, who don’t dine until after 8pm. So we get a good table location. The meal is good, simple and cheap. When we finish we wander …. 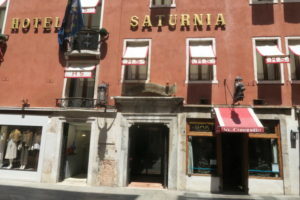 but most everything except the cafes & restaurants, are closed …. so back to the suite for a goodnight rest. Up late – 8am is late for us – shower, shave, a change of clothes, breakfast and we’re off again. Gerda wants to find fields of lavender. 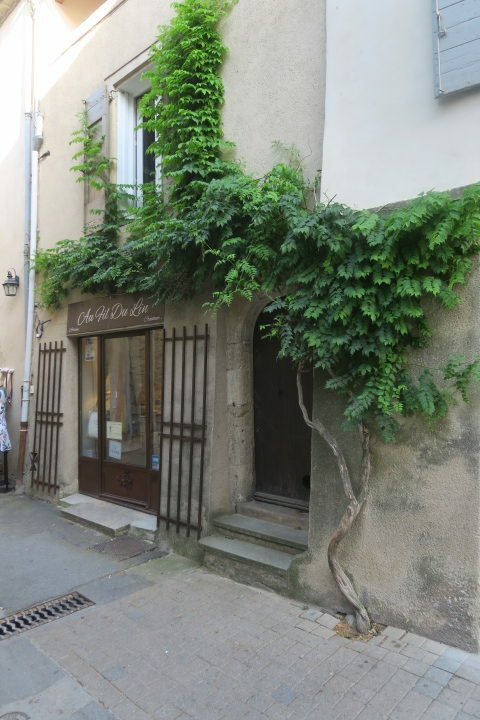 We head to Sault, Gordes and Fontaine-de-Vaucluse. Lots of forests, very hilly, with twisty, narrow winding roads – up, down and hair-pin turns. Not a lot of traffic, but the road never seems wide enough ….. and the locals drive these roads between 80 & 90 kmph or faster. Gerda tried to take a video, but gave it up cause she was getting motion sickness. 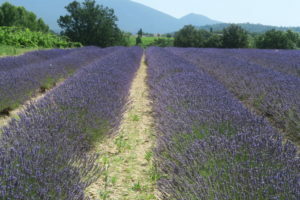 After driving for 45 minutes we saw a field of lavender beside a vineyard. We deeked right to a dirt road and Gerda got out to take pictures. I decided to turn the car around.. what an experience! The car has collision sensors all around. The road had high weeds all around. Everytime the sensors detected the weeds, it would beeped and then engage the brakes. Unfortunately I couldn’t figure out how to turn it off ….. so slowly back n forth, until the car was finally pointed in the right direction. Now we could get our pictures. 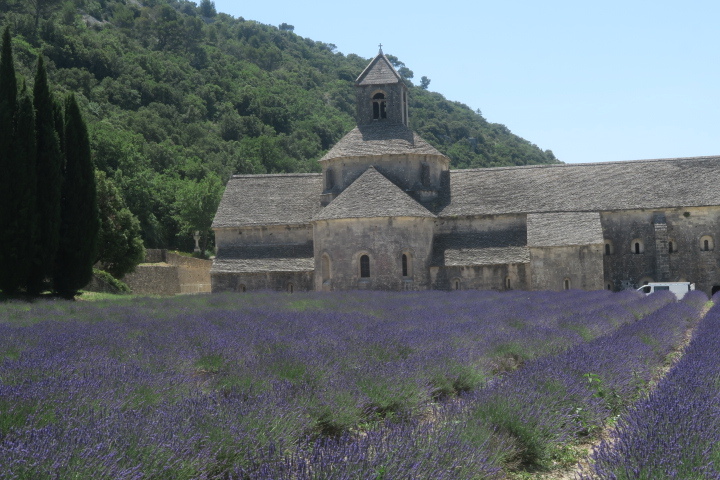 From there we continue on to Gordes where there is supposedly more lavendar. Again I proceeded to get lost in one of the small villages. 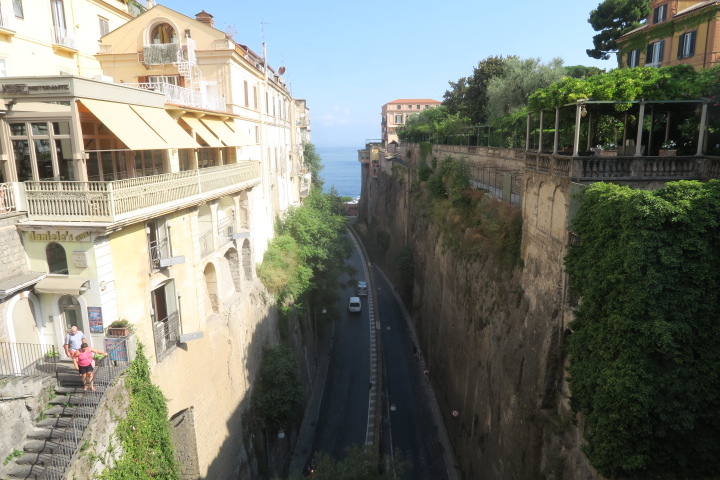 You say how ….. well most of these villages are on rough, rocky hills and built when transportation was by horse and cart ….. so everything is narrow and one way …. and there is no routine update when they do construction or block a road. I am surprised we made it out. The GPS lady was pretty good but also annoying – continually tell us to backup or do a u-turn when none was possible. What an experience but we made, although taking twice the time a local would! 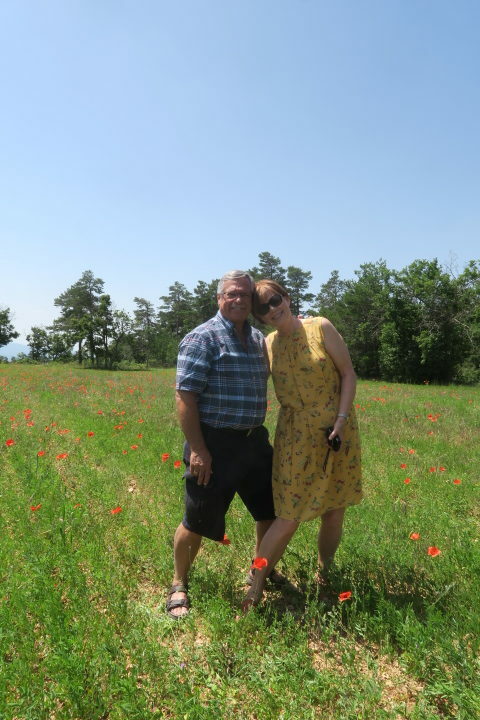 On the way up to Sault, we came across a field of poppies where two ladies were posing and taking pictures of each other. We offered to take their picture together and they did ours. 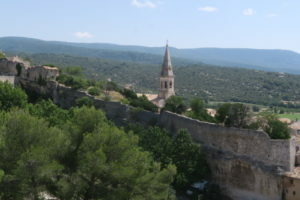 They highly recommended we go to Gordes to the “Abbaye de Senanyue”. So we turned around, punched in the destination and let the nice GPS lady tell us where to go. On the way we came across an unusual landmark – a windmill. It was hard to get a good picture and in the process Brian got other pictures of the town, church and ancient castle (a real one). 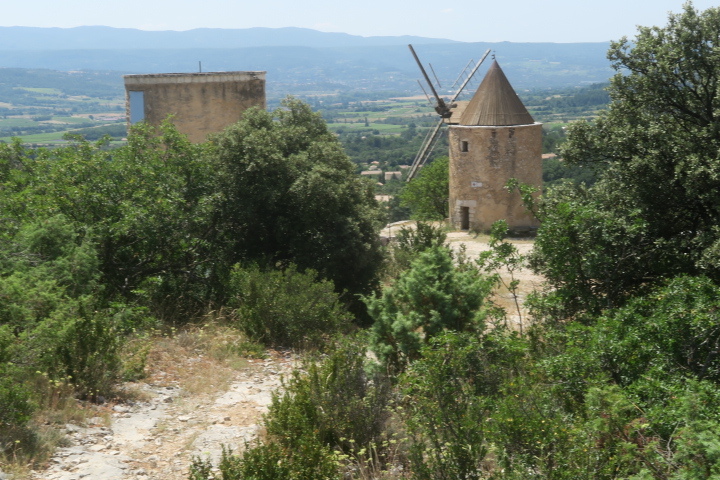 The view from the other side of the windmill was stunning – the church and castle on top of the hill, were joined by massive walls. We weren’t sure how you would access these structures. 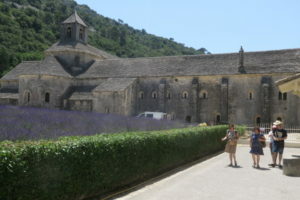 From there we moved on through the twisty roads, with hundreds of meters of shear cliffs to the Abbaye de Senanque. Extremely old and beautiful! 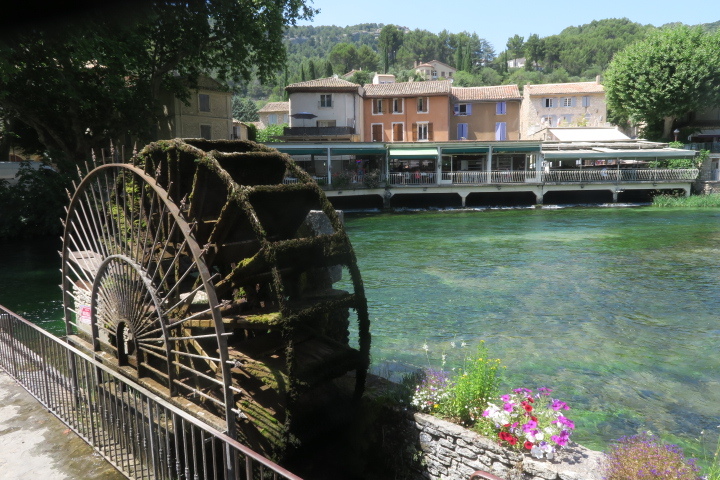 Next stop Fontaine-de-Vaucluse …. 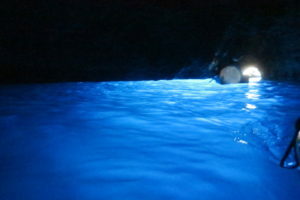 an oasis of water. 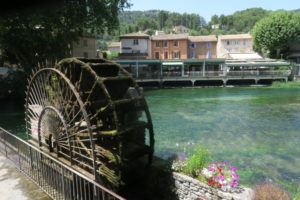 We have a meal by the water and admire the plants and waterwheels. 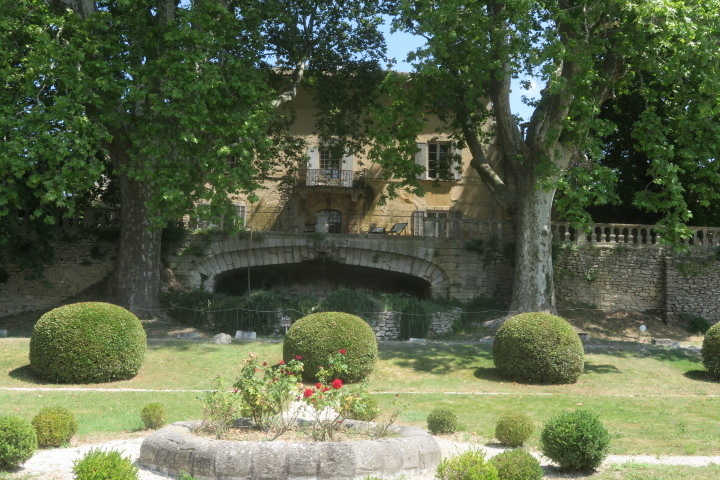 One of the sites we visited in Fontaine is the “Moulin a Papier Vallis Clausa” that produces handmade paper with the methods developed in the 15th century. The area is a magnet for people wanting to escape the 32°C weather. The following video shows part of the ancient method of making paper. Time to return to home base ….. to shower and eat …. and maybe watch football (soccer). 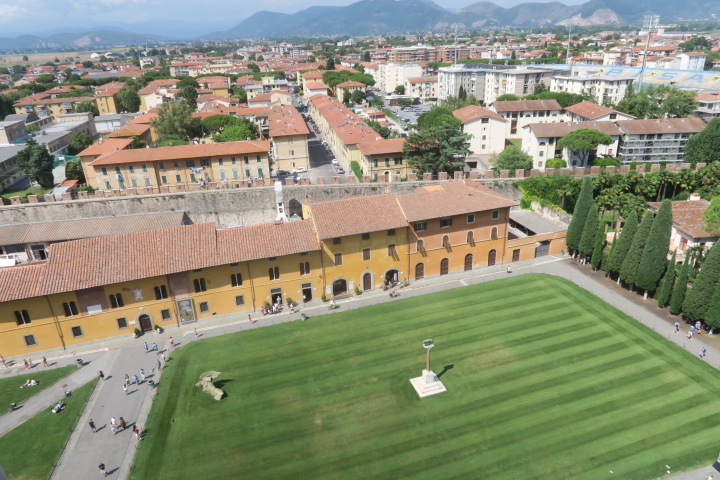 So it’s down to the piazza. Pick a good table to view of the large screen TV – every restaurant seems to have one outside their doors. With World Cup games on, the tables fill quickly – it’s a communal social event. There obviously are delays in the signal received at each restaurant – you can hear the shouts of joy or frustration as a favorite team scored or conceded a goal! Some come sooner or later than others. Kinda-like Rider games, except they happen every day from late afternoon to late evening – sometimes as late as 12 midnight. Finally the game is over and so we can retire (you become a part of the community by staying to watch-participate). With a late start to the morning, we went to Cucuron before noon to see their open market. They have everything that can be made locally by hand … and more. 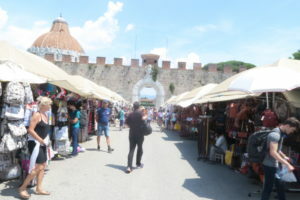 We were tempted to buy so many things but realized we had no way to take them with us. 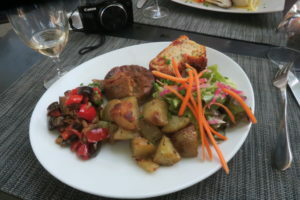 Afterwards we go to Bonnieu to have a light lunch, it’s 3:00pm and then drive to “Chateau la Canorgue” to take pictures and buy some wine. Gerda loved the movie “A Good Year”, with Russel Crow. 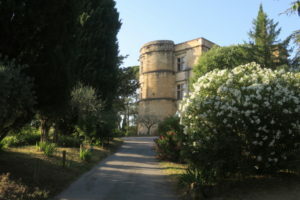 The chateau was one of the main sites featured in the movie. Unfortunately the owners are tired of inquisitive fans invading their property to request tours ….. so we’re content to take pictures and buy a red & a white wine to drink with the Grads in Italy. 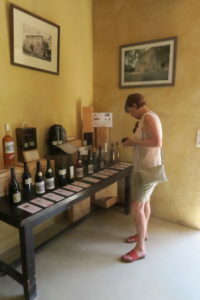 Gerda reviewing and selecting the wines to sample or purchase. Back to base to freshen up and rest before going to dinner in Cucoran. 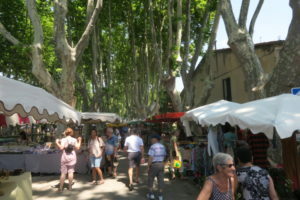 Yes the same place we had visited for the open market. We ordered a vegetarian and a fish dinner. 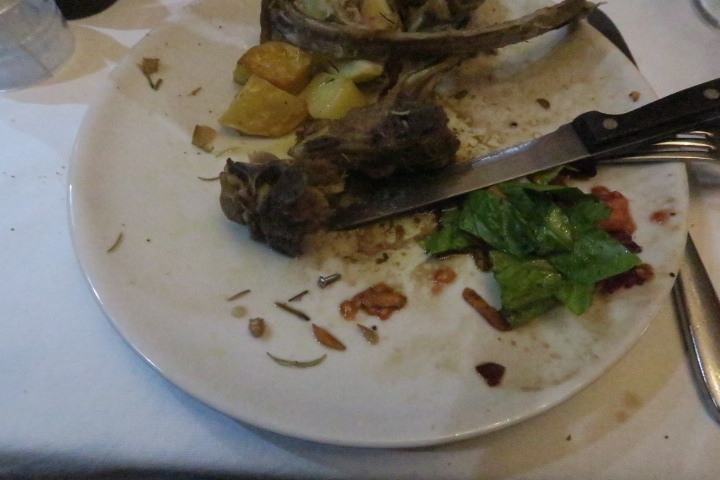 The food was probably the best meal of the trip so far! 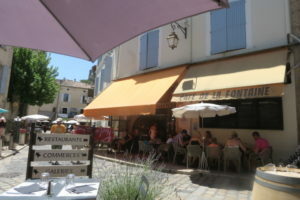 During the meal we chatted up 3 retired British gentlemen, who were doing a cycling tour through southern France. It was entertaining to hear their stories. They still had three more days of cycling before they take the train back to London. We quite enjoyed the banter. 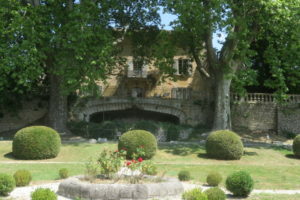 Back to our base and pack so we are ready to go back to “Aix en Province”. 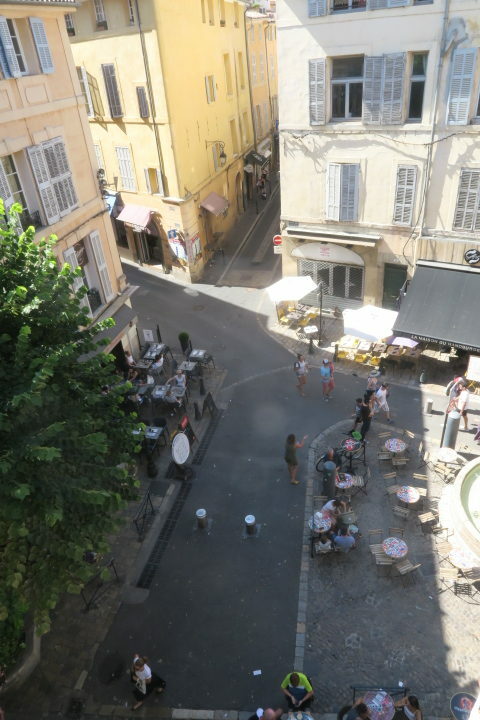 Our flight leaves from Marseille airport at 6:00am, so we decided not to drive during the early morning, through territory we don’t know well – to many risks driving at 3:00am. 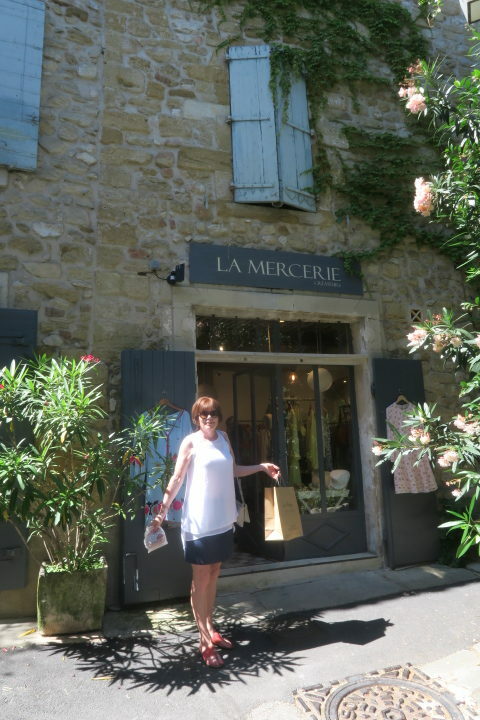 Last day in Lourmarin ….. time to do one more tour of the village. 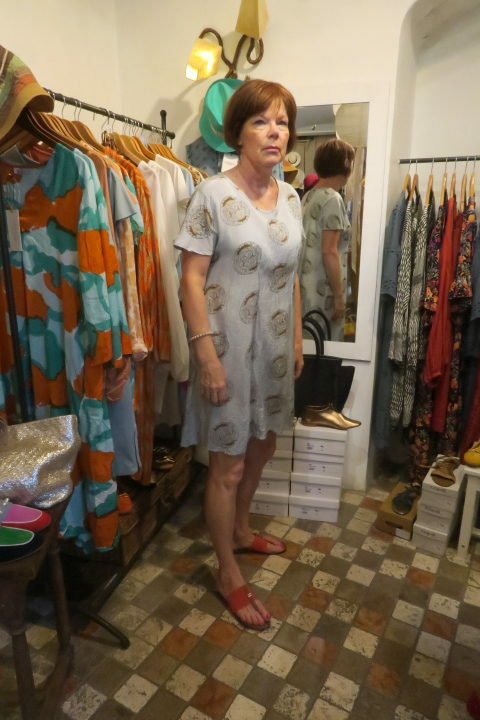 Each day we seem to find more interesting shops. Gerda hasn’t even been in a “catch and release” mode for the first two weeks, so I expect there will be a few trial “catches” and then her & Christa will do some major “deep sea trolling” in Venice …. we’ll need a new suitcase to bring it all home! I was right – Gerda did manage two major & one minor catch on her third shop. So more to pack, as we prepare to leave. 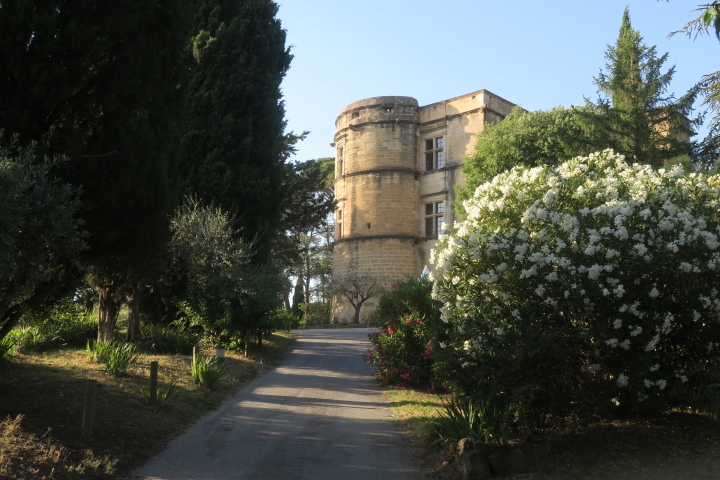 We finished packing and head back to “Aix en Province” …. much fast trip this time as we are now use to the car and local roads. 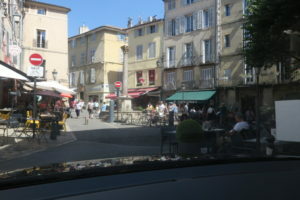 Once we get to Aix en Province we head for the main centre. This time when we park we make sure we have the location down pat. After wandering for an hour we suddenly realize that our original hotel, “Hotel de France”, was only two blocks away from the center. How ironic that we didn’t know. After a quick refreshment, we head to the airport hotel to get rest before our 4:30am check-in with Volotea airline to go to Venice. The flight leaves at 6:00am with us landing at 7:20am. 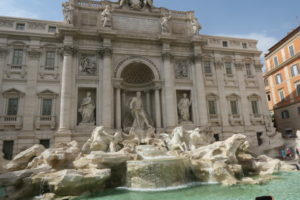 Any other mode of transport gets us there much later – trains 10 hours, taxi/limousine 7 hours, major airline 6 hours (cause you have to fly to Paris or Lyon before going to Venice). Regardless next stop …… Venice! 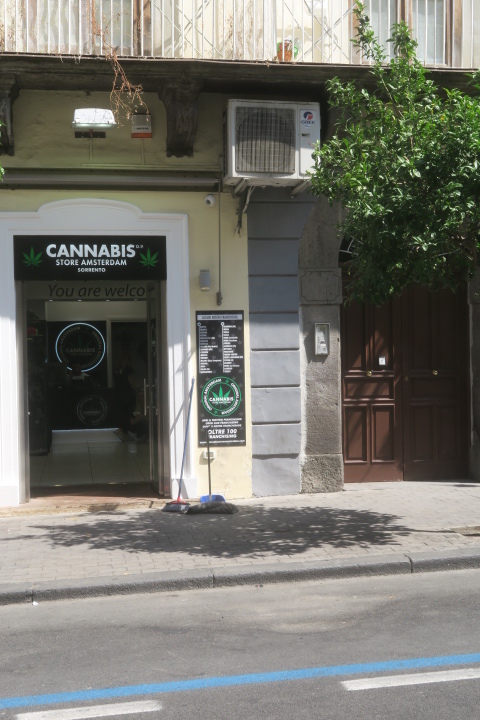 We had a taxi scheduled to take us from the IBIS airport hotel to the airport at 4:15am ….. not cheap – one kilometer 25€ ….. they know they have you ’cause you can’t walk across the highway. Oh well, we are on holidays ……………. and we don’t need to sweat at 4am! Check in for Volotea was straight forward, however everyone in front of us who walked into the entrance for the gates and security came walking back out. 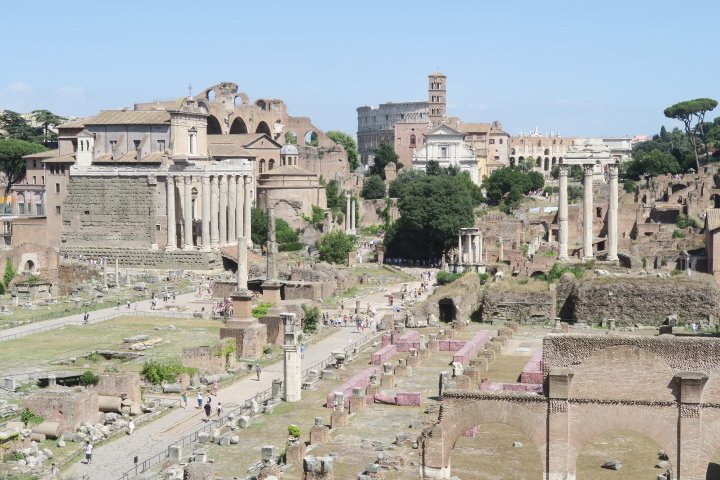 We finally got it straightened out, only to have the security personnel tell Brian to go back three, because he forgot to remove his tablet from the backpack. Once we were through check in, check up and checkout ….. it’s an hour wait to board ….. and then smooth sailing so to speak.